The Walker Art Center in Minneapolis has decided to remove one of its new sculptures, Scaffold by the white artist Sam Durant, due to protests from many Native American artists and tribal groups. 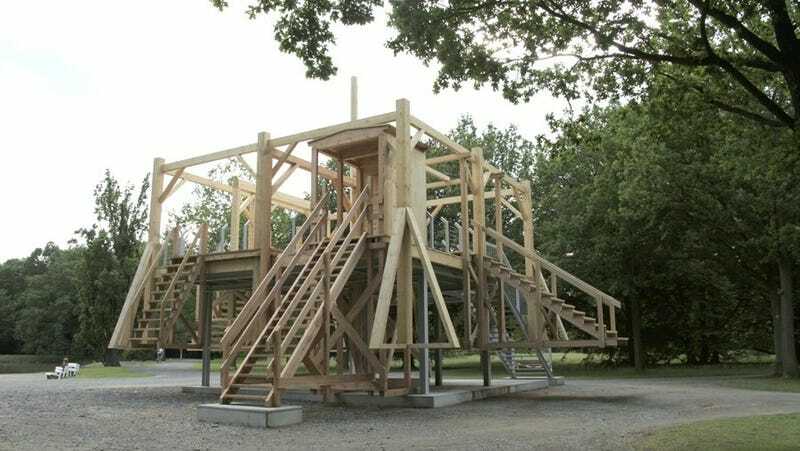 Scaffold, which was originally created in 2012, is a recreation of seven different historically important gallows used in hangings sanctioned by the United States government between 1859 and 2006, all compiled into one large structure. The gallows included in the piece are the ones used to execute abolitionist John Brown, Saddam Hussein, and more. The gallows that caused the most controversy, though, is modeled off the one used to hang 38 Native men, the largest mass execution in the country’s history, during the US-Dakota War of 1862. On Saturday Minnesota’s Shakopee Mdewakanton Sioux Community, which includes members descended from the same band that was executed in 1862, the community called for the sculpture’s removal. For the last few days protesters had gathered outside the museum with signs reading “Not your story” and “Hate crime” while others criticized the structure for looking like a children’s jungle gym. I made Scaffold as a learning space for people like me, white people who have not suffered the effects of a white supremacist society and who may not consciously know that it exists. It has been my belief that white artists need to address issues of white supremacy and its institutional manifestations. Whites created the concept of race and have used it to maintain dominance for centuries, whites must be involved in its dismantling. However, your protests have shown me that I made a grave miscalculation in how my work can be received by those in a particular community. The controversy is similar to the conversation regarding Dana Schutz’s painting of Emmett Till’s casket Open Casket that exhibited at the Whitney Biennial in New York this year. Like Durant, Schutz was criticized for co-opting the suffering of marginalized people and using it to make art. But while the Whitney and Schutz defended the existence and exhibition of the painting, Durant and the Walker clearly recognize and respect the protesters’ arguments.